Rock Creek Sports Club is happy to offer a babysitting service while you complete your workout. 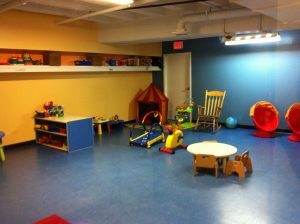 Our dedicated staff will supervise, motivate and entertain your children. For members, we now offer a low, monthly rate so that you can maintain your fitness goals by visiting the club as many times as you wish with your kids. Our convenient 2 hour time allowance will give you plenty of time to take your favorite class, workout, and shower. Babysitting is for children ages 6 weeks to 8 years old, and reservations are not required. Please note: you must remain on the premises while your child is under the watchful eye of our babysitting staff.